Welcome to the Isle of Man Snaefell Wheel Project. 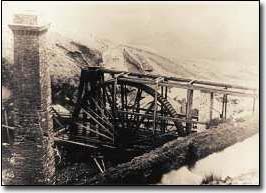 This website has been built by the Laxey Mines Research Group in partnership with Laxey and Lonan Heritage Trust, Laxey Village Commissioners and the Isle of Man Heritage Foundation specifically to draw attention to this combined initiative to bring home the Snaefell Water wheel from a location in Mid Wales to it's rightful home in the Isle of Man. On the 3rd October 2003 the wheel components, which are owned by the Trevithick Society in Cornwall have now been returned to it's rightful home in the Isle of Man, with the kind assistance of Mr. Peter Harvey of the Llywernog Mining Museum in mid Wales and the Trevithick Society. Over the next few months the wheel components will be assessed by our engineers and plans will be formulated for the necessary repair work, with the aim of rebuilding the wheel over the next year. If you feel that you or your organisation can assist us or sponsor us in any way whatsoever in rebuilding this Manx wheel at the Laxey Washing Floors please contact the project leader via the contacts pages. Please take a moment to view the pages of this website and email us with any suggestions or queries regarding this project, please also feel free to sign our guestbook so we have a permanent record of your visit.